Yep, that’s right. Eighty cents. That’s what Instacart actually paid Tom, an Instacart worker, for 69 minutes of his time. 2/1/19 - UPDATE: In response to the uproar over this 80¢ payment, Instacart’s COO&CFO told FastCompany that this was a “glitch” and an “edge case” and that the company will soon be rolling out a minimum payment on each job — a whole three dollars. But this wasn’t a one-time deal. We’ve got receipts. Yep, that’s right. Eighty cents. That’s what Instacart actually paid Tom, an Instacart worker, on January 19, for 69 minutes of his time. We’ve been hearing from hundreds of Instacart workers about dismal pay that falls far below the minimum wage since the company implemented a new pay structure in November 2018. But it’s hard to imagine how any company could justify paying eighty cents for more than an hour’s worth of work. And as a matter of fact, their justification isn’t especially compelling. 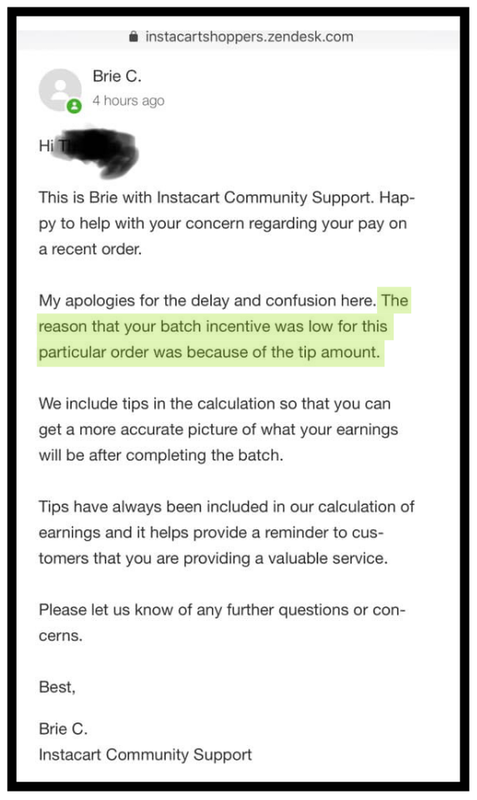 In case that email is as confusing to you as it looks to us, let us help you parse it: what Brie is saying is that because the customer left a high tip on this particular job, the “batch payment” — the amount Instacart actually pays to the worker — was just 80 cents, including a mileage reimbursement. In other words, Instacart is now confirming what workers have been saying since the change in pay structure: that the company is actually using customers’ tips to pay workers’ wages. When a customer tips up-front, it doesn't mean extra money for the worker. Instacart just pays the worker less to make up for it. That's right: the customer's tip doesn't get added to the worker's check — it just gets deducted from what Instacart pays. In other words, up-front tips go to Instacart, not to the worker. Even Instacart seems to know how messed up it is to pay workers less when they get tipped more — which is why they’ve denied the practice when speaking to reporters at Business Insider & the Miami Herald. Now, it seems like Instacart has been hearing us speaking out about the issue…and decided to double down by finally admitting that they’re taking workers’ tips. Instacart knows it’s wrong. Workers know it’s wrong. We know it’s wrong. Let’s not let them get away with it. Think a company paying workers 80 cents for more than an hour of work needs to be held accountable? Want to tell Instacart you don’t think taking workers’ tips is more “accurate” or treats them as “valuable”? Click here to sign on to our demands for Instacart — we’ll be in touch to tell you how you can fight back. And if you’re a customer on Instacart, click here to learn how you can work around Instacart taking your tips by tipping just 22 cents up-front and changing it later.